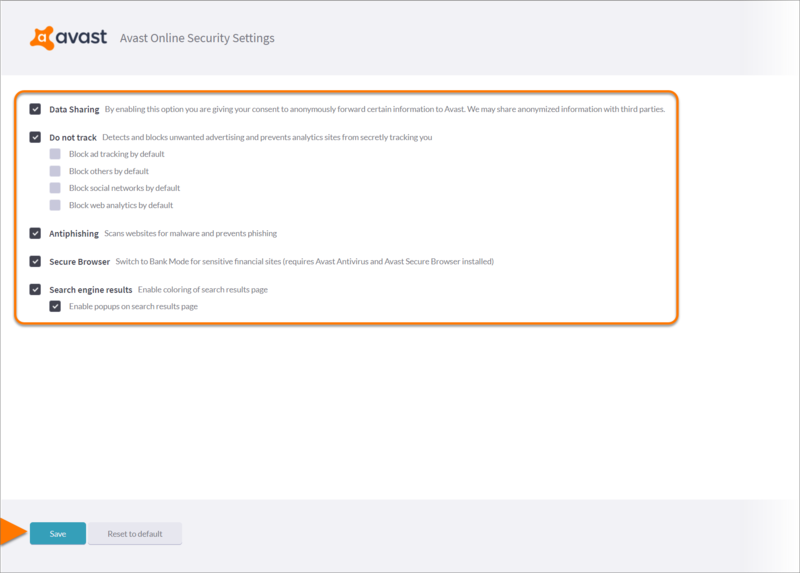 The Avast Online Security web browser extension improves your online security and overall experience when browsing the internet. The extension also offers various options to protect your online privacy. Refer to the sections in this article to use the extension in Google Chrome or Mozilla Firefox. Websites use tracking systems to monitor visitor behavior so they can obtain statistics and other data for marketing purposes. 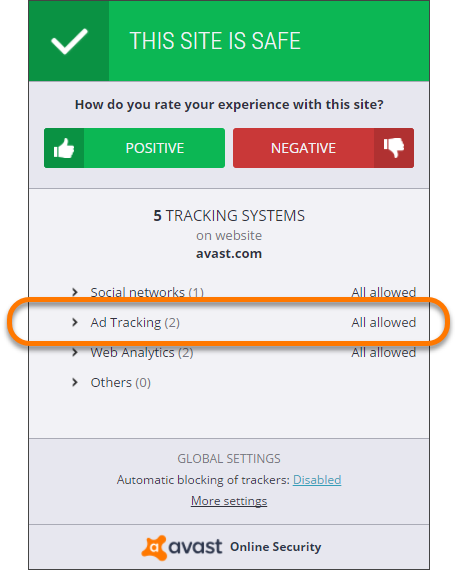 The Avast Online Security browser extension enables you to see details of the tracking systems used by the websites you visit and turn them off to prevent being tracked. When you visit a site that uses tracking systems, the number of tracking systems is visible on the Avast Online Security icon in the top-right of your browser window. The most common types of tracking systems are Social networks, Ad Tracking, and Web Analytics. Alternative types of tracking systems fall into the Others category. Click the Avast Online Security icon in the top-right of your browser window. Click Social networks, Ad Tracking, Web Analytics or Others depending on what you want to block. Click Block next to a specific tracking system or click Block all to block all tracking systems. Selected tracking systems are blocked for the currently open website. To unblock them, click Allow. 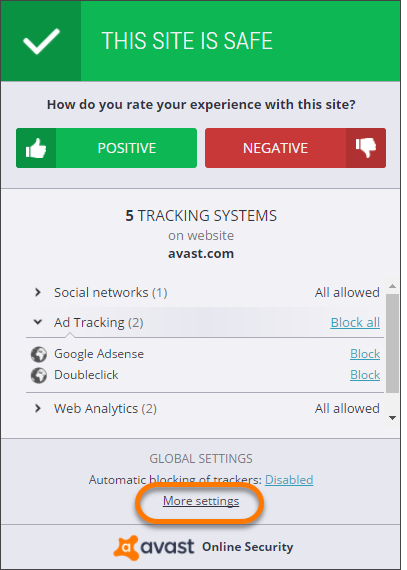 The Avast Online Security browser extension displays information about the browsing quality of the websites you visit based on ratings from other users. 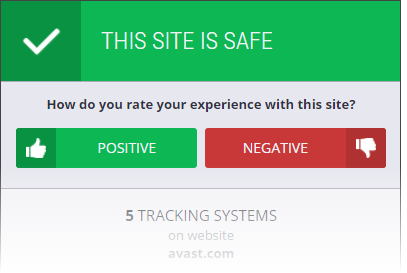 This site is safe: other users rated the website positively. This site is unsafe: other users rated the website negatively. Unknown site: the website does not have enough ratings yet. To contribute to the ratings, click the Positive or Negative button depending on your experience. These ratings help you and other users know whether the sites you visit are safe. Data Sharing: allows you to anonymously forward certain information to Avast to help identify and react to the latest security threats as soon as possible. 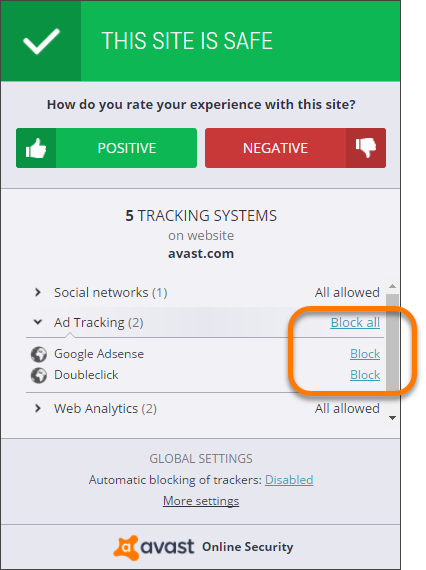 Do not track: blocks ads and prevents analytic sites from tracking you. Antiphising: protects you from malware and phishing. Secure Browser: allows you to switch to Bank Mode when opening sensitive financial sites. Search engine results: enables green ticks and "this site is safe" popups on search result pages.